Crossfire returns tonight, 6:30pm ET on CNN. 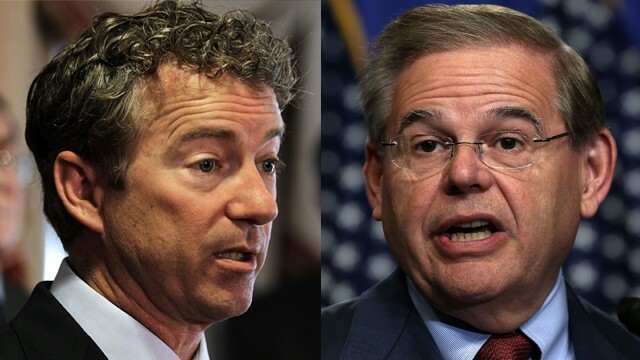 Sen. Robert Menendez and Sen. Rand Paul join hosts Newt Gingrich and Stephanie Cutter in the Crossfire to debate a congressional authorization for a Syria strike. We want you to weigh in on the debate: If you were in Congress, would you vote to authorize a strike on Syria? Vote below or tweet your response using #CrossfireReturns. You can also vote by commenting on our Facebook post. Now that we are focused on Syria the wheels are turning. Obama will give the Republicans the lessor of the 2 evils on the Fed Chair, the Republicans will give Obama the Obamacare train wreck and Benghazi will fade away. I couldn't believe CNN let a conservative viewpoint on the show. I was getting tired of all liberals all the time. I will have to start watching more often. Great job CNN! Let both sides of the issues be argued. Why did the hosts let Menendez try to filibuster the show rather than answer the question. I would have liked to hear what the others had to say. It was all Stephanie Cutter allowing Menedez to talk and cutting off Newt and Rand. This is just a replay of her campaign tactics. Soon, she will be caught in a bald faced lie much like she was (many times) during the campaign. I don't see Newt staying with this program or CNN for very long with this format and for good reason. I was looking forward to watching Crossfire. After 15 minutes of the show this evening I had to turn the TV off. I won't return for future sessions. Cutter was obnoxious. She did not let Paul answer questions without her interrupting him constantly and talking over him. Gingrich on the other hand allowed Menendez plenty of time to express his views. I am an Independent and like to hear both sides but Cutter does not seem interested in allowing the right to speak. I'll watch something else from now on. I really expected Newt Gingrich to be the unreasonable one on tonight's show. Instead, Stephanie Cutter took on that role. Do what has to be done to stop chemical weapon massacres of civilians, children. Don't be a fool-hardy, bombs-away, ready-fire-aim president. Go to congress. The War Powers Act is there for a reason. Build international consensus. To the best of our ability. Take the case to congress and the American people. And, my additional personal preference: Force a vote in the UN. Give peace a chance. But no matter what, stop the slaughter of children. The problem is that after a limited strike what is different? Assad is still in power, still possessing WMDs. What would he have to lose? The slaughter of thousands of children would begin and after they show the pictures of hundreds of dead civilians from the US bombing, millions more around the world would hate the US. P. Obama needs to get some competent advisors in the White House before he really gets us in trouble. THE CONSTITUTION STATES NO WAR UNLESS CONGRESS DECLARES IT! BUT AS FUTURE PRESIDENT I SHALL AUTHORIZE THE REINSTATEMENT OF THE AMERICAN VOLUNTEER GROUP , FLYING TIGERS! THE FINEST AMERICAN MERCENARY GROUP BENT ON DESTROYING TYRANNICAL JAPOS! I sure hope your show is all about George Zimmerman tonight! He is far more important than Syria-just ask the lefties. I support the President on most issues, but on this one I disagree. Should Assad have used chemical weapons? No. Should we do something to stop him? Diplomatically, yes. Militarily, no. We need to stop being the world's police squad. How many other countries have killed thousands or even millions of their own people and we have done nothing? Why pick this one to start? I don,t support the president At that point. It will not good for Americans people to involve in conflict with others. There is always another option rather than being dragged into war.